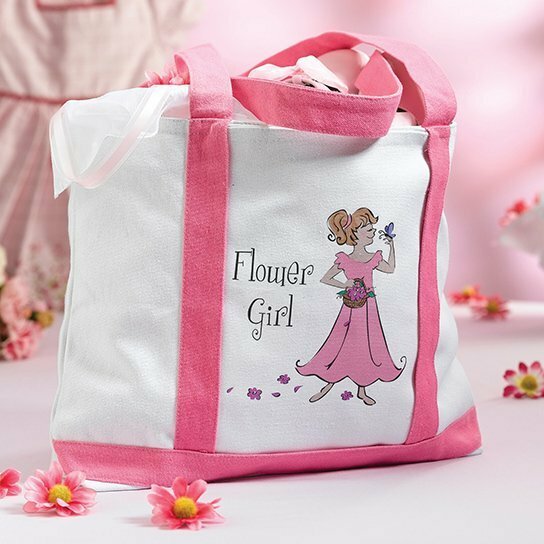 The littlest lady in your bridal party is going to love this special tote meant just for her. It is done in white canvas with pink handles. Measuring 15" x 10" it's the ideal size. Fill it with things to keep her busy at the reception. She'll be proud to carry this bag that boldly identifies her as the "Flower Girl." Embroidered on the front includes the words plus a sweet depiction of a flower girl smelling a flower. Ideas for stocking up on boredom busters include crayons, paper, coloring books, funky erasers, pencil sharpener, stickers, and more. As long as the toys are quiet and not messy, they'll be ideal in this tote.